Massive Chinese scroll, $72,500, Bruneau & Co. Aucrtioneers, Cranston, R.I. Massive Chinese scroll, $72,500, Bruneau & Co.
A gigantic 19th century Chinese archaic poem scroll painting – 24 feet wide by 29 inches tall – sold for $72,500 at an Antiques, Fine Art & Asian Arts Auction held March 3rd by Bruneau & Co. Auctioneers in Cranston, R.I. Also, an Austro-Hungarian silver and ivory secessionist tea set with a tray, teapot and sugar bowl, realized $5,000; a Chinese 19th century rosewood mother of pearl inlaid marble bench brought $5,625; and a pair of palace-size French Sevres-style urns made $3,750. Prices include the buyer’s premium. 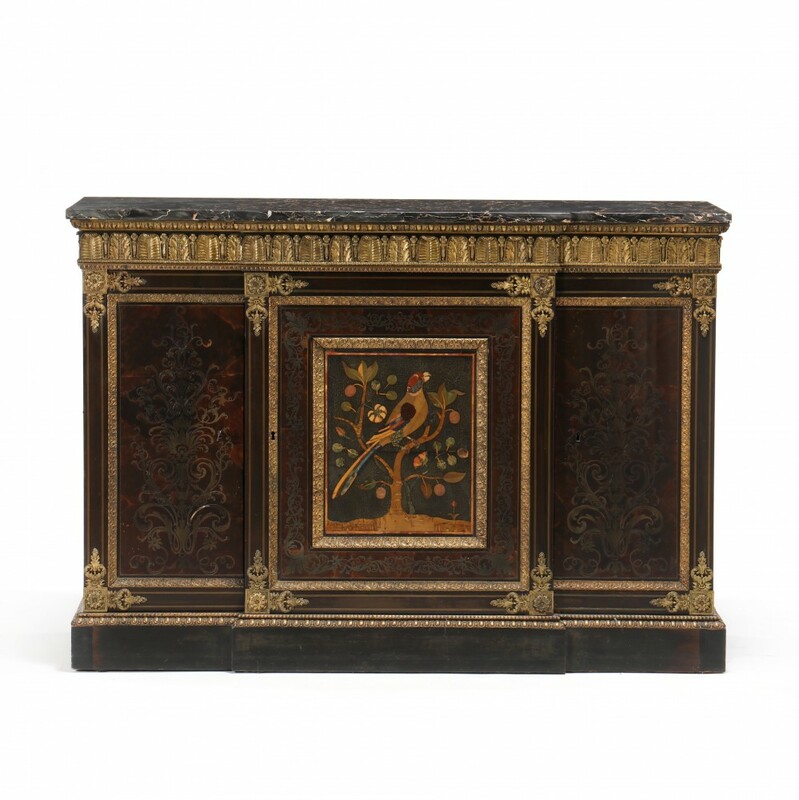 An ormolu-mounted, marble-top inlaid bibliotheque-basse (French cupboard fitted with bookshelves), built circa 1820 by Pierre Levasseur or his son Pierre-Francois, sold for $224,200 during Spring Auction Week held by Leland Little Auctions in Hillsborough, N.C. Also, an acrylic on canvas painting by Maud Gatewood, titled Farm Pond, Snow Ending, made $37,760; a restored 1957 Chevrolet Bel Air Nomad sped off for $43,700; and a Georgian display case went for $17,100. Prices include the buyer’s premium. 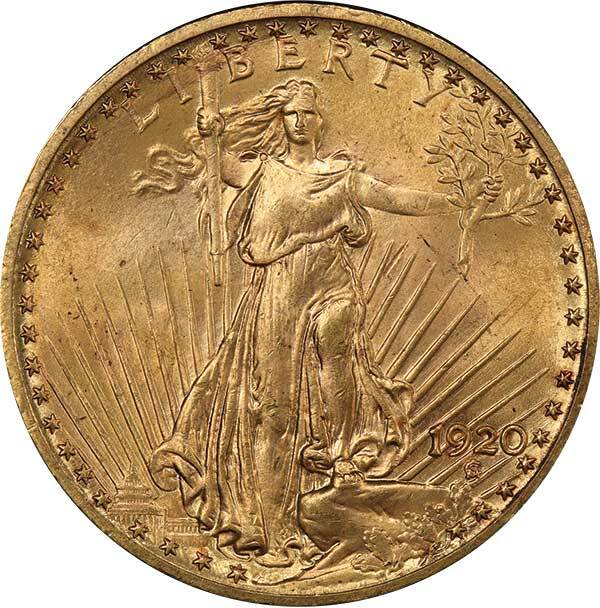 A GEM 1920 double eagle US gold coin graded MS65 PCGS, the finest known, sold for $188,000 at a Regency Auction held January 25th by Legend Rare Coin Auctions (based in Lincroft, N.J.) at the Luxor Hotel in Las Vegas, Nev. Also, the finest known original proof 1852 US dollar coin, one of only a few known, realized $129,250; an 1802/1 $5 US gold coin, graded PCGS MS64+ CAC, brought $76,375; and an 1893 $2.50 US gold coin, PCGS PR67 DCAM, hit $47,000. Prices include a 17.5 percent buyer’s premium. 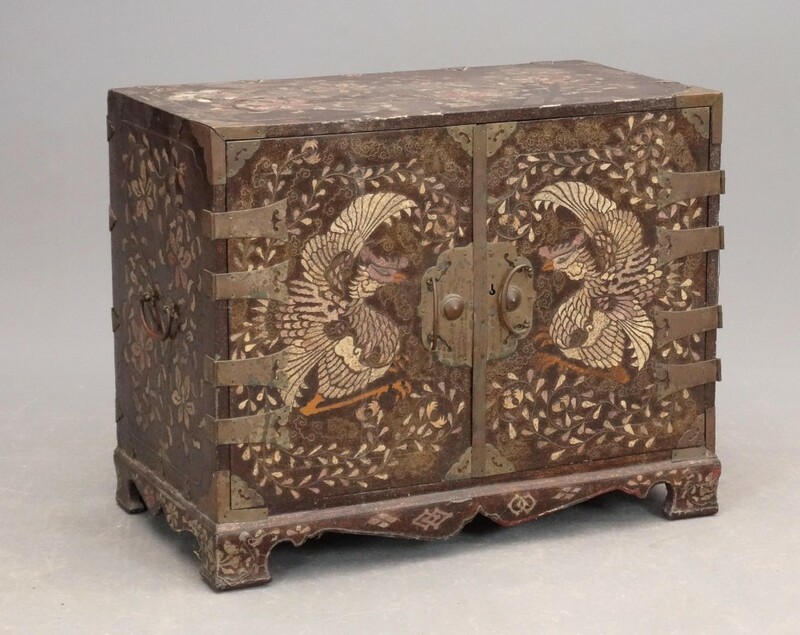 An Asian inlaid and brass mounted two-door chest with a multi-drawer interior sold for $9,145 at an unreserved estate sale held February 17th by Copake Auction in Copake, N.Y. Also, a pair of Wedgwood Jasperware candlesticks, each one 13 ½ inches tall, realized $3,540; a copper in verdigris patina leaping stag weathervane, 27 inches in height, fetched $3,304; and a Jules Cheret French poster on cardboard, 52 inches by 37 inches in the frame, changed hands for $2,478. Prices are inclusive of the buyer’s premium. 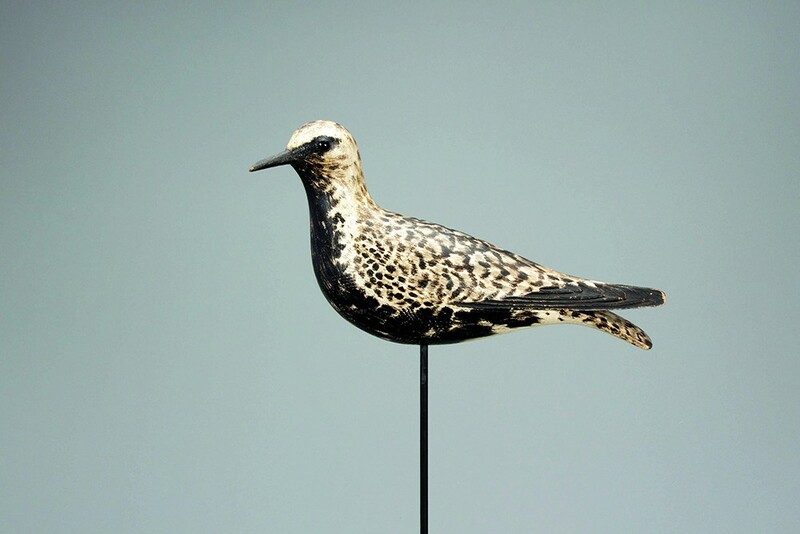 A turned-head plover decoy by the renowned carver A. Elmer Crowell (1862-1952), sold for $156,000 at a Winter Sale held February 16th by Copley Fine Art Auctions, at the American Theater in Charleston, S.C., during the Southeastern Wildlife Exposition weeklong event. Also, a running yellowlegs by Crowell fetched $72,000; a Canada Goose by Capt. Charles C. Osgood (1820-1866) went for $72,000; and a standing black duck by Ira D. Hudson (1873-1949) gaveled for $96,000. Prices include the buyer’s premium.